Here is the list of best free CPU usage monitor software for Windows. These software let you view CPU usage in real time and also CPU usage graph. In the following list, you are going to find dedicated CPU usage monitor software with tiny interface or no interface at all. These software float on your computer’s screen and display real time CPU load. Some of these software not only display CPU usage, but also display RAM usage, Network usage, Disk space, and more. Some of these software are advanced System monitors or Task managers, which let you view and manage various other PC related operation other than to monitor CPU usage. So, this list is comprised of software that are not only CPU usage monitor software, but also carry out various PC maintenance and management operations. Go through the list to find out which CPU monitor software suits you the best. To quickly take a look at CPU performance, I would like to use Big Meter Pro. Its a small and attractive tool which not only looks cool but provides real time CPU load data. There are various other software that I like, but for basic CPU usage monitoring I would go with Big Meter Pro. However, if I am looking for something that can monitor CPU, RAM, temperature etc., then I would pick some other tool from this list. You can also checkout the list of best free CPU Stress Test Software, Hard Drive Repair Software,and Software To Speed Up Computer. Windows Task Manager is Windows’ default tool, which not only lets you manage and view processes, but also lets you monitor CPU usage. It displays CPU load percentage along with CPU load graph. It also displays RAM usage and network usage. The number of running Processes is also displayed here. You can also view and manage services, startup apps, and carry out various other things from here. In the following list, you will find many other Task Managers with advanced options. Resource Monitor is an advanced version of Windows Task Manager. It is also Windows’ native tool, and can be directly accessed from Windows Task Manager. It does almost the same job as Task Manager, but with more number of graphs. One of the graphs displays overall CPU load, other displays Service CPU usage, and the rest of them display CPU usage of each CPU core separately. I tested it on a dual core PC, thus total 4 graphs are displayed. Along with CPU performance, you can also view Processes and Services running on your PC. My CPU Monitor is a simple and free CPU usage monitor software that operates from Windows system tray. Its a customizable tool that blinks or displays warning when CPU usage reaches a given threshold stage. You can either set it to blink or show warning when CPU usage is higher than 80%, 85%, 90%, or 95%. All the warnings and blink alerts are displayed from the system tray. The options to blink and to show warning can be turned off separately. So, you can activate/deactivate either or both of the alerts. A simple right click on the icon of My CPU Monitor in the system tray displays options to set warning parameters. 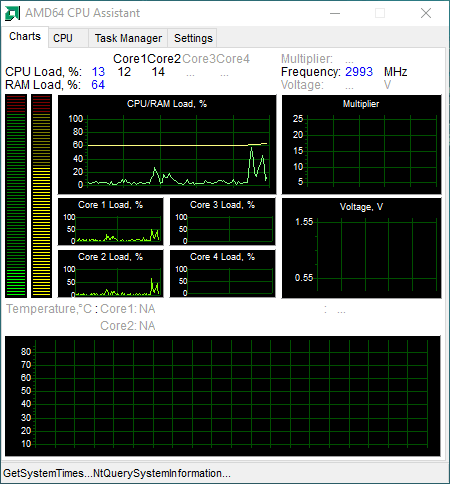 Performance Monitor is a simple yet amazing CPU usage monitor software for Windows. It lets you view CPU usage statistics as graph on small tiles. There are various tiles that display your CPU core performance, Memory usage, Disk usage for both read and write functions, and Network download and upload usage. All the statistics are displayed as graph, and to view the real time numbers, simply hover your mouse over a tile. You can place these tiles and arrange them anywhere you want on the desktop. Graph type, tile size, and various other parameters can be changed right from the settings menu. Settings menu can be accessed from the system tray on the task bar. It is one minimalist and good looking CPU usage monitor, providing you real time CPU performance. CPU Monitor lets you view CPU usage in real time. This CPU usage monitor floats on your PC and displays real time CPU performance in percentage along with graph. It also displays average CPU usage percentage. If you want, you can change its parameters according to your choice. You can set the graph type as bar graph or line graph. You also get to change the calibration percentage, graph update interval, CPU usage update interval, etc. Its another simple option which only displays CPU usage percentage. Big Meter Pro lets you monitor CPU usage in real time on a round meter shaped interface, as shown above. It displays real time CPU load percentage in figures along with a pointer. As the CPU load varies, it is displayed on the interface. Not only CPU usage, you can use it to display Memory usage, Disk usage, and Process usage. The interface is customizable and you can change the opacity of dials, and pointer shape. You can also make the interface keep floating on the top of all open applications. AMD System Monitor has been developed as a CPU usage monitor, which also monitors and displays RAM usage and GPU usage statistics. Real time CPU usage percentage and graph are displayed on the interface. And CPU usage for all the cores of your CPU are displayed separately. Right below CPU usage, you will be able to view RAM usage. It displays the memory in use, modified memory, and free memory. It also display GPU usage if you have one connected to your PC. The best thing about this CPU usage monitor is that, you can actually log CPU performance. Simply hit the Record button and the CPU usage data will be logged in a CSV file. I tested it on both AMD and Intel processors and it showed CPU usage for both. AMD64 CPU Assistant is a CPU usage monitor specially designed for AMD64 CPU processors. You can also use it to monitor CPU temperature. Just like Windows’s default Task Manager, it displays CPU usage and also lets you view and manage Tasks. I tested it on an AMD CPU and also on a CPU with Intel dual core processor, and it showed CPU usage for both. It displays CPU/RAM load percentage and respective graph, along with load on CPU cores. Unfortunately, the temperature monitor did not work for the both processors. There are other tabs available with this CPU usage monitor freeware. One lets you view CPU information, while the Task Manager tab displays all the running tasks. You can select a task and end it if you want from here. SSuite System Monitor, as a simple CPU usage monitor, displays very useful data on its interface. The floating interface displays RAM usage, CPU usage, and PFL (page file load) usage in percentage. Some additional information is also displayed, such as number of CPU cores, power source type, and current IP address. You will not find any other option here apart from the mentioned ones. This CPU usage monitor software is good only if you casually need to keep a check on CPU usage. SysGauge is an advanced software with CPU usage monitor tool. It not only lets you view CPU usage, but also displays memory usage, disk activity, network activity, and more. Its working mode is a bit different than other software mentioned here. You have to add a counter to view respective data. To view CPU usage, you will have to add CPU usage counter. Here you can view all CPU core usage or select a core to monitor its usage. It displays real time CPU usage in percentage along with a time vs CPU usage graph. On the bottom of the interface, you can view current, average, maximum, and minimum usage statistics. Do the same to add other counters to view their usage, such as memory, disk, and network. It has an Analysis feature that analyzes your PC for errors and warnings, and displays counter status and status of the processes running on your PC. Its not suitable as a CPU usage monitor software that always floats on your PC to view real time CPU data as you work. CPU Usage in Tray is a simple CPU usage monitor software that sits in your computer’s system tray to display CPU usage. It only displays CPU usage in a tiny graphical space. Depending upon the number of your CPU cores, bars are displayed, and each core’s usage is displayed in those bars. This tool only lets you keep an eye if CPU usage is not high enough. You cannot even view precise usage statistics as it will not show the CPU usage percentage. All you can do is change the color of the bars. System Explorer is a free computer monitoring software that can be used as a CPU usage monitor. It gives you detailed info about various services and processes going on in your computer. CPU usage can be checked out in the Performance section, where you will be able to view Processor usage, CPU core usage, RAM usage, and more. The usage is shown with the help of graph and real time performance figures. The graph displays performance percentage vs time plot. There are a lot more things that you can monitor about your PC with this software. It lets you monitor tasks, processes, network activity, services, drivers, etc. You will also find system utility tools here, such as program uninstaller, autorun manager, security scanner, etc. It is multipurpose system utility which can be used to keep a complete check on your PC. PCNetMonitor is another simple and free CPU usage monitor software for Windows. It can not only monitor your PC, you can use it to monitor remote PCs if you have authentication for them. Along with CPU usage, it also displays RAM and Network usage. All data is displayed on a pretty neat interface after a regular interval of time. You can define the time interval after which CPU performance data is to be updated on the log. You can also view average CPU performance of last 1, 2, 5, 10, and 60 minutes. To monitor CPU usage of a remote PC, simply enter the IP address of the PC which you want to monitor. If authentication is required, you will be asked to enter username and password of the remote PC. That’s it; after the authentication, this software will start displaying CPU usage of the connected remote PC. To monitor your PC, simply add your own IP address to the IP address section. All the PC performance data can be logged in .txt format. 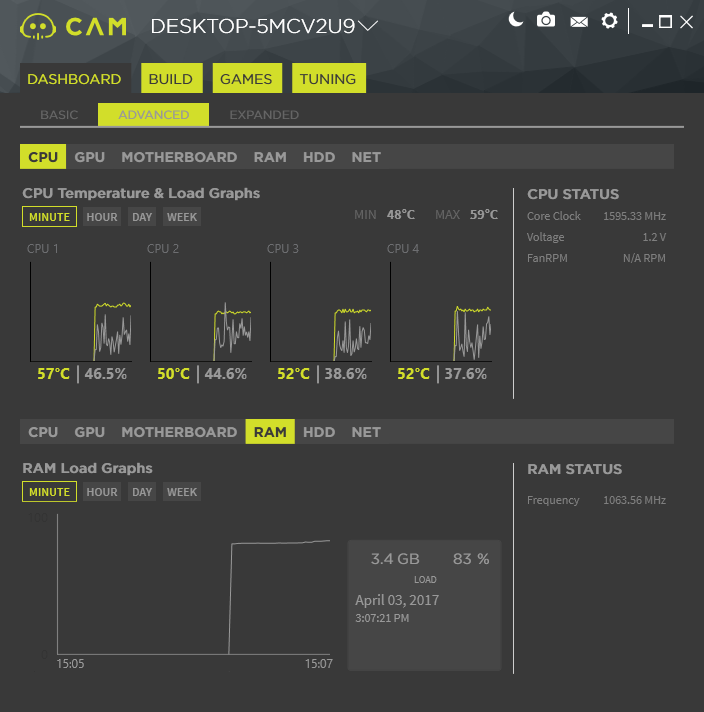 CAM is a free CPU usage monitor software and also a GPU usage monitor, designed specially for gamers. Along with CPU usage, it also displays GPU (graphic processing unit) usage. On the main interface, you will view all the monitoring units. These units display the following CPU and GPU related data: CPU load, CPU temperature, GPU load and temperature, CPU fan speed, GPU fan speed, RAM load, and hard drive memory info. All these readings are displayed in real time. If you want to view graphical data, go to the Advanced section. Here, you will be able to view CPU temperature and load graph on time scale of minute, hour, day, or week. You can also view GPU, motherboard, RAM, hard disk, and network usage graph in this mode. Another mode, named as Expanded, displays CPU statistics in detail. Here, you can view core wise CPU stats, bus speed, CPU voltage, fan speed, internet activity, and more. As I said, this product has been specially designed for gamers, and it can be used to boost GPU performance by overclocking it. CS Fire Monitor is a simple computer monitoring software that lets you view CPU usage. Along with CPU usage, it has tool to monitor bandwidth, drives, and computer hardware. As you start this software, it minimizes to system tray. A very small floating panel is displayed near system tray, which shows real time CPU usage in percentage. Click on its neon green icon in the system tray to open up its interface. On the interface, you can view CPU usage statistics in a graphical form. Also CPU speed and general CPU info is displayed. Click on the Bandwidth, Drives, or Hardware options to view respective data. You can also generate log reports for the recorded CPU usage statistics. Open Hardware Monitor is a hardware monitoring software that also lets you monitor CPU usage. You can easily view total CPU load, load on CPU cores, RAM load, along with CPU temperature and power consumption. You can also view GPU and Hard Disk usage statistics of your PC. The values displayed are real time values, along with minimum and maximum values. It also has option to view a graphical plot of recorded data, but it didn’t seem to work. The recorded values can be saved to your PC in .txt format. Its one of the best hardware monitoring software which lets you monitor CPU usage in real time. 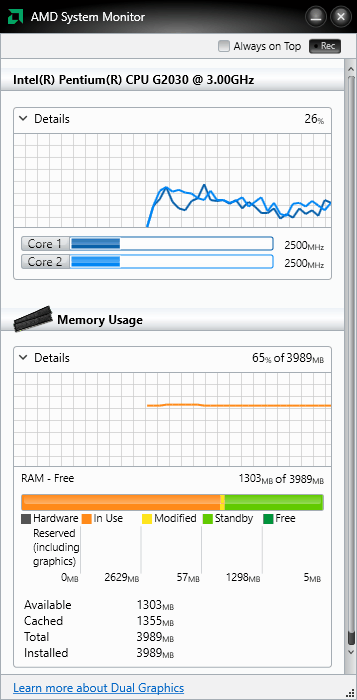 Moo0 System Monitor is another good CPU monitoring software for Windows. It displays real time CPU load, CPU temperature, RAM usage status, Hard disk usage and temperature, along with network activity. Graph for CPU load, Hard disk load, and network activity can also be viewed. In addition, your network IP and PC up time are also displayed. It is a simple and handy tool to keep a check on your computer’s statistics. Yet Another (remote) Process Monitor is a free CPU usage monitor that lets you view CPU usage of your computer and remote computer as well. Here, you can monitor CPU load, RAM usage, services, and network usage. Real time info and graph plots are displayed. It is primarily a process monitor that lets you view all the running process and manage them. But, you can also monitor CPU usage pretty easily. This software by default lets you monitor processes, CPU usage, services, and various other system info of your PC. To monitor CPU usage of other PC, first thing you need to do is add that PC for monitoring using its IP address. It uses Windows’s Remote Access feature to get all the process and CPU data from other computer. Its a very good software to monitor activities going on your computer as well as remote computers. CPU Charter Portable is a simple yet interesting CPU usage monitor. It displays CPU load in percentage, running average percentage of CPU load, load percentage on CPU cores, and a load vs. time graph. All of this is displayed on a pretty simple, small, and neat interface. If you want, you can make its interface float on your computer’s screen to stay on top. I would use this software if I need a lightweight CPU usage monitor software that stays on top of all application or hides according to my choice. RAM Booster lets you boost your RAM memory by shutting down unwanted process running on your computer. What made me include it in this list of CPU usage monitor is the presence of CPU and RAM usage meters. CPU usage meter displays CPU load in percentage, and RAM usage monitor displays RAM usage in percentage. So, if you are using this software, you will be aware of the amount of load on your CPU. So, get this software if you not only want a CPU usage monitor, but also a tool to reduce RAM and CPU load. 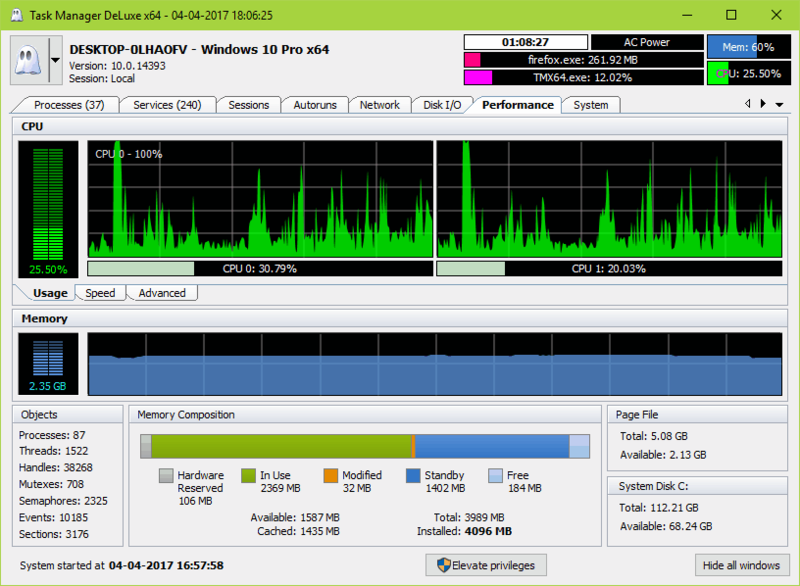 Computer System Monitor is another free CPU usage monitor for Windows. It displays real time PC monitoring data, such as CPU load, RAM usage, and internet connection status. In addition, you can also view internet download speed here. The interface is quite average and might be a good option for your kid’s PC. Sidebar Diagnostics is a highly customizable free CPU usage monitor that displays info on a side bar. By default the sidebar appears on the left side of the desktop. Here you can view CPU info, CPU load, CPU temperature, load on CPU cores, etc. It also displays RAM usage and Network usage statistics on the sidebar. It is a feature rich tool which not only displays real time info, but also lets you view performance graph of CPU, RAM, and Network usage. The advanced settings option of this sidebar CPU usage monitor lets you customize its looks, contents, and much more. You can customize how the sidebar will look by changing its color, transparency, text alignment, width, etc. Apart from CPU, RAM, and Network, you can also add GPU and Drive monitoring modules to the sidebar. All in all, its a very powerful, visually appealing, and highly customizable CPU usage monitor that you will love. CpuInfo is a software to view CPU usage with a clock like interface. It displays CPU load in real time on a speedometer type clock. The CPU load needle deflects on a scale of 1 to 10 based on the real time CPU load. The interface keeps floating on the computer screen above all the running programs or apps. The numeric meter below displays the amount of time since the computer was booted. This helps you determine if PC load has increased with time or has been the same since boot. CPU Monitor lets you monitor CPU usage from system tray as well as from its interface. On the interface, it displays CPU load in percentage as Used CPU percentage. It also displays available CPU load capacity in percentage. You can set it to display either or both Used CPU load and Available CPU load in percentage in the system tray of your PC. Its a very simple and free CPU usage monitor without any advanced options. @ CPU Monitor not only monitors CPU usage, but also sets off warnings for increased CPU usage. Here you can set threshold CPU load value, and when CPU load increases, a warning is displayed in a small box near system tray. CPU usage threshold in percentage. Frequency to check CPU usage. Time to wait before sending kill notice for CPU and Memory usage. Time to wait before sending warning message for CPU and Memory usage. DTaskManager is a free task manager tool that is almost similar to Window’s native task manager. Along with CPU usage monitoring, it lets you view and manage running applications, processes, performance, ports, network, and more. The CPU usage can be viewed in the Performances tab of this software. Here you can view CPU usage in percentage, CPU usage graph, RAM usage, and RAM usage graph. It also displays detailed System, Memory, and Pagefile usage. Its a good software if you are looking for a bit advanced alternative to Windows Task manager. MiTeC Task Manager Deluxe is another advanced Task Manager software for Windows which can monitor CPU usage. Just like the above mentioned freeware DTaskManager, you will find the CPU usage data in Performance tab. Why choose MiTeC Task Manager? Because, it is a bit more advanced than the above one. It not only displays the overall CPU load, but also displays CPU usage of all the cores of your CPU, along with their respective graphs. You can also view real time RAM usage along with a graph. Basic Drive info is also displayed. As its a task manager software, you will find various other tabs here. In these tabs you can view and manage Processes, Services, Sessions, Autorun programs, Disk input/output, and more. 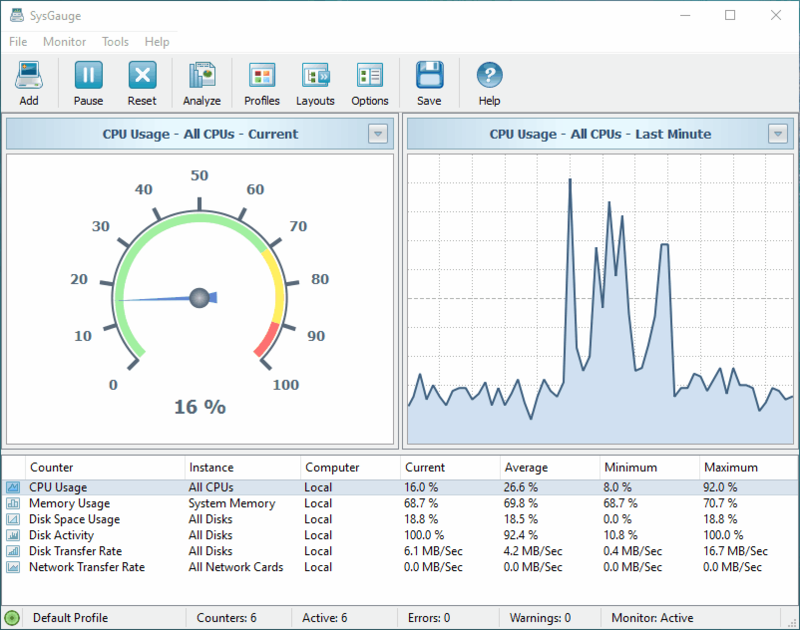 3R CPU Monitor is a lightweight and amazing CPU usage monitor software. Using this tool, you can either view CPU load percentage either in system tray or on a floating interface. Talking about the floating interface, you can choose either or both from CPU usage as graph and Real time performance on a clocked interface. You can change the CPU info update interval according to your choice. It also lets you set a default position to place the CPU monitor interface after startup. PC Performance displays CPU load, used RAM, and used boot HD space on a very small interface. The data displayed is real time and you can even change the stat update speed. You can also set visibility of interface from fully visible to invisible using a slider. The above interface you are seeing is the expanded view of the software, which when hidden reduces to just meters that show CPU usage. WinUtilities Free is a free computer maintenance and cleanup tool that can be used to monitor CPU usage. It is a feature rich software with lots of tool to maintain a healthy PC. But, I am not going to throw light on these tools, instead I will talk just about the CPU usage monitoring tool. CPU performance can be checked under Modules > System Tools > System information. This opens a new window where you will find detailed info about your PC. In this window, go to the Performance tab. Here you will find CPU usage, Memory usage, and Paging File usage statistics. View real time CPU usage, Average usage, maximum usage, and CPU usage graph. It also displays some additional info about the total number of processes open, process using maximum memory, process using maximum kernel time, and more. You can choose this software for multiple purposes, one of them being CPU usage monitoring. Get more info on the homepage of this software. Glary Utilities is a well known system cleanup and maintenance software, which can be used to monitor CPU usage as well as view CPU related info. Its just like WinUtilities Free that I mentioned above, loaded with tonnes of features and tools. To monitor CPU usage, you will have to go to Advanced Tools > System Tools > System Information. This will open up a new window, where you will have to go to System Devices tab. Here it not only displays real time CPU usage, but also displays load plot for CPU cores. Other than these, you will find CPU related information, such as CPU name, frequency, core type, etc. Read more about Glary Utilities here. WinBar is a free and amazing tool that lets you monitor your PC and also provides instant access to some other tools. It is highly customizable tool where you can change how it looks and can decide what you want to monitor or which tool you want access for. It is basically a thin bar that can be set to stay at the top, bottom, right, or left corner of your computer’s screen. Also you can set it to hide after a given amount of time. Talking about the CPU monitoring configuration, you will need to activate it from WinBar’s Configuration menu. In the Plug-in menu of Configuration, select the CPU status option. Set this option as Active. You can also select the options to show CPU usage histogram and show CPU usage status separately for all cores of CPU. As soon as you activate it, the CPU usage statistics will be displayed on the WinBar interface. Other plugins options available that you can add on WinBar are: Disk usage monitor, Memory status monitor, Uptime monitor, Google search bar, DU meter, etc. So, go ahead and use WinBar as a CPU usage monitor software, or add more tools and monitors according to your requirement. Rainmeter is a highly customizable utility that can be used to monitor CPU usage in real time. You can customize it to add various tools, monitors, apps, right on your desktop in form of tiles. You can also modify it to change how it looks in many attractive ways. Lets talk about the CPU usage monitor instead of wandering off to know other features of this tool. If interested, read more about Rainmeter here. When you start Rainmeter for the first time, it displays 3 tiles by default. One of the tiles named System, displays CPU usage, Memory usage, and SWAP usage. In case System tile is absent, simply right click on any Rainmeter tile that opens up, go to Illustro > System and click on system.ini option. This will bring up the CPU usage monitor tile. There are various other tiles that you can add from the Illustro option. You can also download various skins and customize Rainmeter. SysMate is a portable system monitor utility that can be used to monitor CPU usage, RAM usage, and network usage. On the small interface, it displays the above data along with a CPU usage graph. I like this tool not because it is small and provides the detail I am looking for, but it also lets you view all the running process and kill selected processes in case CPU usage is high. You can also use it to restart, hibernate, or shutdown PC if required. CPUMon Lite is another free CPU monitor software, only for personal and non-commercial usage. It displays real time CPU usage in percentage, along with CPU usage graph on a small floating interface. You can also view RAM usage in percentage and also on graph. Its another simple CPU usage monitor that you can use if you want to use it for your personal PC. There are some advanced features that you can unlock by upgrading to the Pro version.